Three special tours are planned for NATS National Conference attendees:A behind-the-scenes visit with one of Las Vegas’ popular Cirque du Soleil shows, an express tour to the Hoover Dam, and a post-conference Grand Canyon getaway. This year’s attendees at the NATS National Conference in Las Vegas have the opportunity to enjoy three special tours. 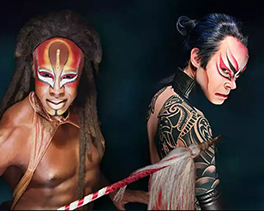 On Thursday afternoon, June 21 we’ll go behind the scenes of one of Las Vegas’ popular Cirque du Soleil shows, “KÀ” at MGM, and understand the technical demands on the singers who must demonstrate their own vocal gymnastics. We’ve also planned a half-day express tour to the Hoover Dam on Thursday, June 21 and a day-long post-conference getaway to the Grand Canyon on Tuesday, June 26. Conference attendees can add these Special Events to their package when registering on the NATS National Conference Registration page. If you have already registered for the Conference and would like to add any of these special events to your itinerary, please click here. Join us as we visit behind the scenes of one of Las Vegas’ popular Cirque du Soleil shows, “KÀ” at the MGM Grand. We will learn about the technical demands on the performers and the music that is performed by singers who must demonstrate their own vocal gymnastics both on and off stage, as non-singing performers depict a visually rich story line. Meet the music directors who lead these intricately planned and choreographed feats day after day. Tour Starts at the MGM Grand at 1:30 p.m. The MGM Grand is adjacent to the Tropicana and conveniently accessible by a bridge walkway from the hotel. Limited availability – Maximum 30 in group. Your professional driver/guide will provide narration on this round-trip tour from Las Vegas while you enjoy a ride on a luxury motor coach with airline-style reclining seats, foot rests, on-board restroom, air conditioning, and large vista view windows so you won't miss a thing. The mighty Hoover Dam created Lake Mead – the largest man-made lake in the Western Hemisphere. Don’t miss your chance to stand on top of this amazing piece of American history. Tour lasts approximately 4.5 hours. Spend a day away from the hustle and bustle of Las Vegas to experience the raw and natural beauty of the Grand Canyon South Rim. Words and even pictures cannot fully describe this stunning gift of nature. First photographed by Timothy O’Sullivan in 1871, we continue trying to capture the beauty of this geological wonder, but nothing compares to seeing the Grand Canyon in person. Gray Line has been providing Grand Canyon sightseeing excursions since 1947, so it’s fair to say that they have mastered the amazing tour experience to ensure you have the best possible touring experience. Your day will start by departing from your hotel in Las Vegas. En route to the Grand Canyon, your tour guide will provide you with expert narration of the area’s most historical and interesting facts about the Spanish explorers, numerous native cultures, and the early Western Settlers of northern Arizona. A delicious lunch is provided at the exclusive National Geographic Visitor Center, where you can enjoy lunch and do some souvenir shopping before heading in to the Grand Canyon National Park. Upon arrival, you’ll have free time at Mather Point to explore the trails lining the canyon’s edge or to simply take in the amazing sights of the Grand Canyon. Prepare for a spectacular experience that you will not soon forget! Heading deeper into the National Park, we will stop for more sightseeing time at Bright Angel Lodge, one of the original hotel destinations at the Grand Canyon South Rim located directly on the edge of the Grand Canyon itself. Get ready for a nice relaxing ride back to Las Vegas in comfort aboard Gray Line’s luxury motor coaches.